5793 labyrinths found. Showing 1081-1100. Sorted by country, state, city, then zip/postal code. 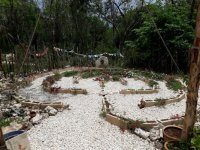 Although on private property we do hold public courses and meditations and are in the process of building a meditation retreat centre with cabins in the rain forest sleeping 20 in the Mexican Jungle In the Sacred Mayan Riviera. 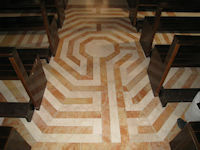 We also conduct Hand fastings in front and on the labyrinth. 20° 50' 53.696° Lat. ; 86° 52' 33.981° Long. Laberinto con una instalacion sonora, inspirada en los estados solido, liquido y gasesoso de la materia. Labyrinth with a sound intervention inspired by the 3 states on the matter solid, liquid and gases. 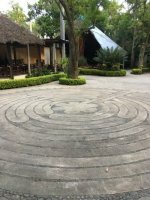 Eco-park resort with a stone labyrinth. Open 365 days/year. Looking east from the entrance in the direction of the ocean and the rising sun. About 3 Kms. south of the Tulum ruins on the coast. 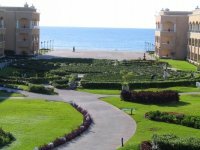 Open to guests of MayaTulum at all times except if a pre-arranged event is in progress. Otherwise, non-guests are welcome by appointment. 7 circuits with 13-foot diameter center with four sitting rocks. Also incorporates Mayan symbolism with the 20 turns each signifying one of the 20 sacred glyphs of the Mayan calendar. Thirteen Royal Palm trees encircle the perimeter and they are each 13 feet apart (in honor of the 13 lunar cycles). km 13.5 Villa de Arista to Moctezuma local road. 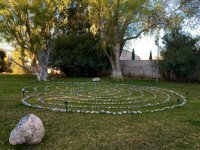 The labyrinth in located on a private working farm with vineyards that produces table grapes/wine and tomatoes and bell peppers in greenhouses. Please schedule appointment by email - fee is used to assist local school community. 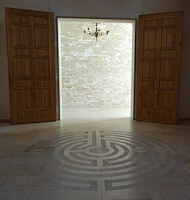 The labyrinth is located in the Faith, Hope and Love Chapel on the 5th floor of the Global Education Building. Situated on open ground about 1.4 km north-east of Jomson Airport, and consequently visible from aircraft coming in to land! Built from rocks, with high walls. 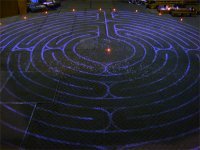 The Labyrinth is located in a wharehouse that is part of a community in a semi-industrial area. 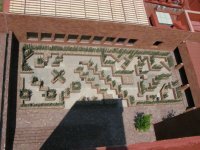 The labyrinth is placed upon the Noordermarkt (the Northernmarket), in front of the Nooderkerk (Northern Church), although it is not related to the church. It is on the corner of Westerstraat and Prinsengracht. The builders are Henk and Regina Coppens. The place was dowsed. The center is a leycenter. 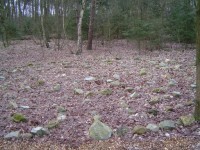 This small neo-classical labyrinth is located in the Vondelpark. The most easy way to find it is looking down from the Van Baerlestraat-bridge that is crossing the Vondelpark. You can access the labyrinth from here with stairs. Another way is enter the Vondelpark from the Leidseplein entrance - walk about 200 meter into the park and, just before undergoing the mentioned bridge above see the labyrinth on your left hand.